Book 2019 now and save $25 per booth! More space available at Oddmall? See below! Our upcoming show November 10 & 11 is sold out! . I contacted the Fairgrounds and I am able to get additional space in the building next to our current building. I have room for 33 additional vendors in this space and I would like to offer you a new location to sell your items before the holidays. Do not pay, simply exit out without paying when you reach Paypal, it will send me your completed submission. If we get enough people to sign up, I will send out invoices on 11/1 and you will have until 11/5 at Midnight to pay. If we do not get enough interest I will let you know on 11/1. We are in a bit of a time crunch. So I am asking if you are interested, to please sign up by 10/31/18 at midnight. Oddmall Vendor Spotlight part 2! This weeks vendor spotlights part 2! Greeting cards, fine art prints and original artwork (paintings and sculpture). Metaphysical healing stones, natural, altered and formed as well as in handmade, vintage and modern jewelry, eclectic collectibles. I make ruanas, belts, & skirts from scarves – mostly pashmina, velvet burnout, and fall plaids. My own design, they are eclectic and unique. I hand sculpt original figurines for casting into functional soap bars made of vegetable oil. Unique prints on dictionary pages. We sell scrap leather and sheepskin by the pound as well as finished goods made from the reclaimed leather and sheepskin. Home goods – leather trays and pillows, Accessories – headbands, bat bows, earrings, sheepskin insoles. Hand made glass drinking straws and carrying cases. All of our glass straws come with a cleaning brush and dishwasher safe. Along with a lifetime guarantee. There are many different styles to choose from and Custom Accents. We have Lady Bugs, Paw prints, Sea Turtles and more that we put on the glass straws. Our Carrying Cases are also handmade with organic cotton, natural batting and cotton thread. Our favorite themes are sealife and geeklife. Original Paintings,Prints,Canvas prints, cards,coasters, trivets, pillows, note books and pendants and earrings with my art on them. I screen print the coolest in horror, punk, and pop culture cloth patches! Today we are proud to be spotlighting these 8 vendors! We sell one-of-kind eco-friendly paper (wrapping paper and notecards) and hand-crafted textiles (pillows, scarves, and bags.) Each product features our unique designs that originate from our nature photography. We use our products to inspire conservation by providing an up-close look at nature’s beauty. Our customers develop a greater appreciation of nature while knowing a percentage of their purchase goes towards nature conservation. I will be selling prints and originals of chalk pastel drawings and oil paintings depicting bizarre and absurd scenes of freaky/cute cartoon characters. My style is bright, vibrant, colorful, deceptively dark, edgy, psychedelic and busy. I will also be selling postcard sized prints and copies of my step drawings, curriculum for children to create my characters with simple shape construction. I sell geeky and fantasy themed Christmas stockings and ornaments. I sew nerd/geek inspired clothes, bags and purses. I also make soap and bath items. I make all natural hemp cbd and arnica body care for pain relief. 2019 Booth sale – Best Deal Ever!!! 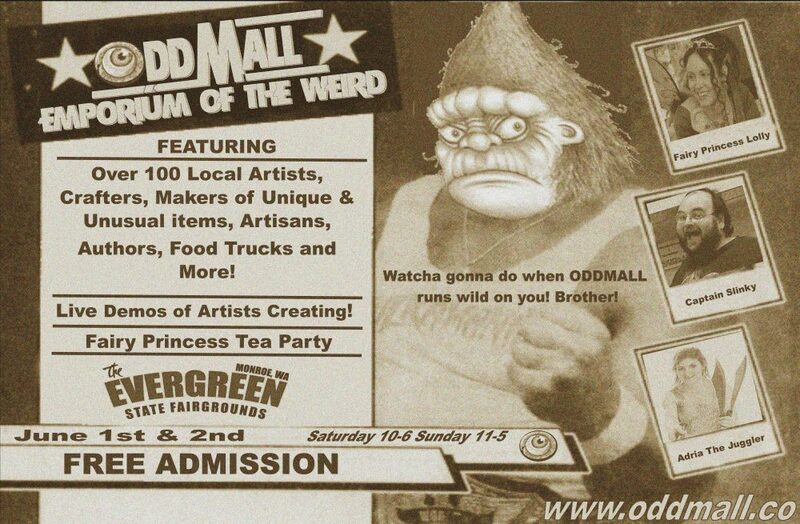 Nab one booth or two or three or even four at any Oddmall show in 2019 for only $150!! It’s that simple. Just select the appropriate options when choosing your booth. .It’s so absurdly simple only a complete buffoon could possibly flub it up (just kidding; if it gives you trouble or you can’t figure it out please email David and I’ll help you through it). It’s happening now through the month of September and applies to any booth at any 2019 show! Use code SEPT2019 to get the discount. Holiday #elfie on the shelfie sitter!